The White House role-out of the nuclear deal with Iran (pdf) has the feeling of a car dealer trying to pull a fast one over on his customer. You know the make, model, year, and color of the car you ordered and it's not the brown, rusted, bucket of bolts he's trying to give you when you show up. First, he tries telling you that it is, in fact, precisely the car you ordered. As you shake your head, he switches gears and tries to tell you how good the car is anyway when you can clearly see it's not roadworthy. Frustrated, you demand to receive the vehicle he promised you. Who wouldn't? In 2012 Barack Obama declared that the only deal he would accept with Iran is one where "they end their nuclear program. It's very straightforward." That's the proverbial car he ordered and the world signed up. What his negotiating team returned with is far from what he promised. It is all the more glaring when pausing to consider that what began as a negotiation to lift sanctions in exchange for Iran ending its nuclear program morphed into trading sanctions relief and a host of other rewards for a temporary reprieve of their nuclear enrichment. Iran needs this deal far more than the U.S. and Obama had a much stronger hand. But he elected not to play it. For months, both appearance and reality was that any deal is better than no deal, rather than "no deal is better than a bad deal," as the White House claimed. Instead of keeping up the economic pressure that brought Iran to the table and ratcheting it up when deadline after deadline passed, the Obama administration eased sanctions, made the use of force appear as a non-credible alternative, and generously gifted America's leverage. In essence, Barack Obama drove into the dealership with a Lexus and left with a Yugo. The White House didn't drive the hardest bargain they could to get the best deal. In fact, no one in the administration is even making that case—that they exhausted all diplomatic options. It renders as preposterous the straw man arguments put forth that the choices are either Obama's diplomatic concessions or war. The question to be asked is why they set the bar so unacceptably low and why the American people must pay for that original sin? One doesn't need to pry too deep into the details to find fatal strategic flaws with the Joint Comprehensive Plan of Action (JCPOA). Take, for instance, the punishment to be meted out if Iran violates the deal--something many experts believe will happen. 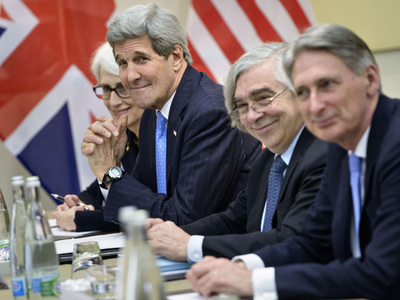 The Obama administration claims an array of sanctions will magically "snap back." However, no such international mechanism exists and in reality, the very concept is White House mythology. Look closely at the text of the deal (pdf). Paragraph 26 says, "The EU will refrain from re-introducing or re-imposing the sanctions that it has terminated implementing under this JCPOA." Contrary to the Obama administration talking points, the agreement makes clear that all past and future business contracts signed by Iran are immune from sanctions--up until they are found to be in violation of the agreement. That completely guts the impact of snapping back sanctions as a long list of real and hypothetical, private and state businesses line up to do business with Iran, eager to avoid any punishment if Iran cheats in the future. If that were not bad enough, the last paragraph in the text of the main agreement makes clear that "if sanctions are reinstated in whole or in part, Iran will treat that as grounds to cease performing its commitments under this JCPOA in whole or in part." That means if Iran cheats and economic sanctions are imposed as the agreed penalty, they can scrap the whole deal. This recourse of international sanctions--which is either non-existent at worst or too weak by definition at best--is the only penalty for an Iranian breach of the agreement. In effect, the punishment is the same if Iran is caught putting a nuclear warhead on a missile, or if they agree to inspections on Wednesday but delay until Thursday. It's sanctions and Iran is free from any commitments. In practice, it means that a wide variety of infractions will go unpunished as no one will want to blow-up the deal over minor to mid-level breaches of the agreement. Simply put, Team Obama not only pulled a bait and switch on the vehicle it promised to deliver, but it is selling the safety features of what turns out to be defective airbags. There are three core questions that must be answered when considering this purchase. The first is if the agreement prevents Iran from becoming a nuclear power? The second is if the concessions granted to Iran are worth the price of the agreement? The third is whether the deal is in the long-term security interest of the United States. The answer to all three questions is No. Unfortunately, the agreement turns out to be a blueprint for Iran's legitimate emergence as an accepted and unrestricted nuclear state. Worse, it is an internationally backed research and development agreement that improves their nuclear and ballistic missile programs during the course of the deal. The American people have been given a lemon instead of a Lexus and are being told to pay up for the dealer's mistakes in process. The best answer is to reject the deal, return the car, and get something better. The dealer owes at least that much.